Hello! We’ve got such adorable puppies to share with you this week! We’re open seven days a week in both locations and you’re welcome to visit anytime. Our puppies go home with all of their puppy shots already completed, not just the first, and they also go home with our unique Lifetime Warranty. 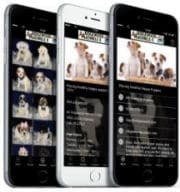 Here at Ridgewood, we’re happy to go over potty training, scheduling, behavioral training or anything else you are curious about or need advice on to help make the process go smoothly. We just love all these newbies, and can’t wait to send them out in the world with you! Plan a visit soon and enjoy the new puppies below! This week, Ridgewood welcomes Josie, Quinn, Oxford, Moccasin, Stiletto, Petunia, Dannon, Dante, Juneau, Nyla, Nyah, Peyton, Fawn, Macon & Makayla! 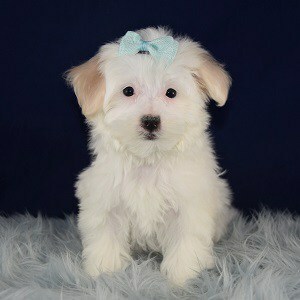 Up first this week we have a beautiful, snow white Maltipoo puppy! Josie is such a gorgeous little girl and she is so excited to start bonding with a forever family! This sweet girl is a perfect choice if you’re looking for a lap dog or companion. She’s also wonderful with children and other dogs and loves her playtime. Such a well rounded little girl! 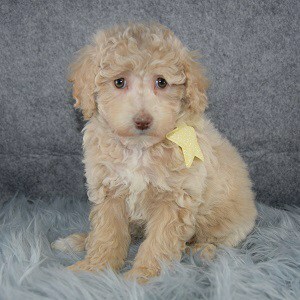 Being half Maltese, half Poodle, Josie will not shed and is a great puppy for you if you have allergies. She’s so excited to start her life with you, so give us a call today to make her yours! Quinn is up next! 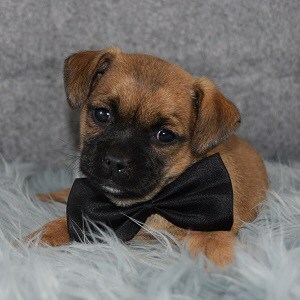 This sweet little boy is a Shichon and is very eager to meet you! 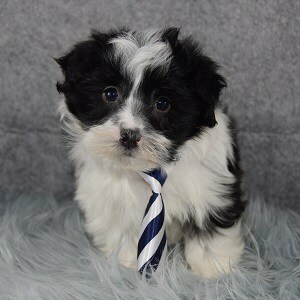 He is half Shih Tzu, half Bichon Frise and is another great choice if you need a non shedding puppy. Quinn loves playtime and is so content playing by himself with his favorite toys. He is not a needy puppy, is very well behaved and can’t wait to learn lots of good manners through training! Visit with this sweet pup anytime, or reserve him online today! Now we have three beautiful Shihpoo puppies! Oxford, Moccasin and Stiletto are three of the peppiest, silliest pups! If you ever need cheering up, or a smile put on your face, these three pups are more than happy to do it with their hops and skips, dancing around the play area or their kisses! Shihpoos are a great pet for families with children and they train very well. These three can’t wait to meet you and start being a member of your family, so stop in to make one yours today! 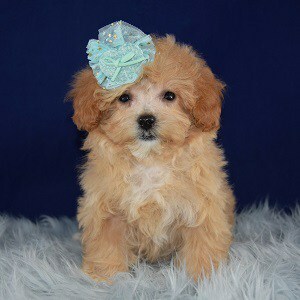 Petunia the Teddypoo is up next! This beautiful girl joins her sister Tulip and Daffodil in the hopes for a forever home this week! Petunia is a mix of Shih Tzu, Bichon Frise and Toy Poodle. She won’t shed and is wonderful with kids! Teddypoos are a mix we’ve done many times in the past and they are always full of joy and bring so much love to their families! Petunia will be no exception! This sweetheart can’t wait to go home with you so visit her today to make her yours! 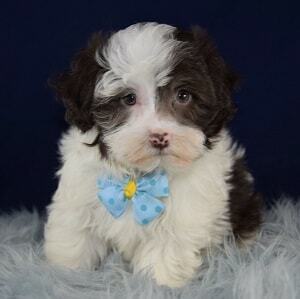 Next we have two…wait for it…Havanese!!! We know so many of you have been waiting for this breed and while we have just not been having luck in having litters, we finally have these two sweet boys! Dannon and Dante are two of the friendliest, silliest little puppies and love to give kisses and make new friends! Havanese are a non shedding breed and train so well. These two boys can’t wait to start a lifetime of snuggles and adventures with you, so give us a call to make one yours today! Sweet Juneau is up next! This sweet, tiny girl is another Shichon very eager to go home with you! She is a very small girl and is the last of her litter. She hopes to find a forever family just like all of her siblings! Juneau will make a great companion dog and has a wonderful personality. She’d make a great emotional support or therapy dog! You’re welcome to visit her anytime, or give us a call to make her yours today! We have two beautiful Cockapooliers up next! 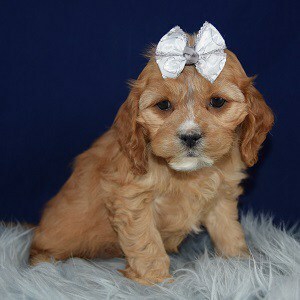 Nyla and Nyah are a mix of Cocker Spaniel, Poodle and Cavalier King Charles Spaniel and are a fantastic choice for families with children. These girls love to play and are so sweet and gentle! Cockapooliers are a good pet for families who want a gentle but always up for adventure type of dog. These sisters have been sweet little treasures to us and while we’ll be sad to see them leave us, we can’t wait to hear about all the joy they bring to their forever families! Pay them a visit anytime! Up next we have Peyton! This charming, peppy, little guy is a Mal Shi. 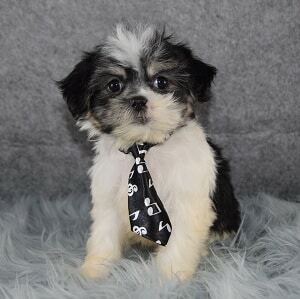 He’s half Maltese, half Shih Tzu and happiness and laughter follow him wherever he goes! Mal Shis are a great lap dog, and also make great emotional support dogs. This sweet boy lives to make humans happy and deserves to be the most spoiled little man ever for it! We can’t wait to hear all about him as he grows and he hopes to go home with you very soon! Reserve him online today! And now we have Fawn, a very sweet Bichonpoo puppy! 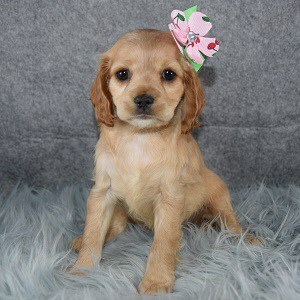 This adorable girl is a great choice if you have children. She is so happy and gentle during playtime, always trying to make sure everyone is having a good time! Bichonpoos are amazing pets for people who have allergies and they are so good with their training. This girl cannot wait to join a family and become one of the pack, so stop in to make her yours today! 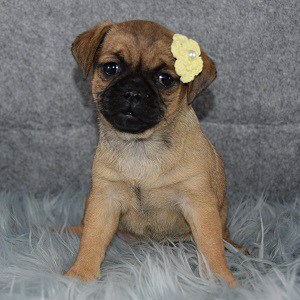 Last up for this week we have two beautiful Jug puppies! Macon and Makayla are two of the friendliest pups and can’t wait to meet you! They love making new friends and love having a good time with children during playtime! These two cuties are half Jack Russell Terrier, half Pug and make great pets for families who like to be on the go and have their four-legged family members with them. Stop in anytime to visit with these cuties, or give us a call to make one yours today! That’s all for this week! Thank you for checking out the new puppies! They’re all eager to find families, so feel free to visit anytime. See you back here next Tuesday!